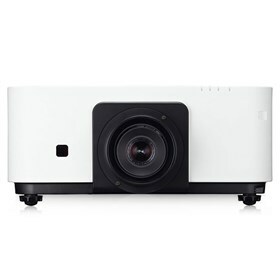 The NEC NP-PX602WL-WH is 6000-lumen advanced DLP professional installation projector with lower power consumption and ECO Mode™ technology. The projector has automatic keystone correction, cornerstone and geometric correction. It features quick power-off, advanced AccuBlend, AutoSense and built-in wall color correction. The NP-PX602WL-WH also features TileMatrix, closed captioning and virtual remote. This projector has lamp-less operation, seamlessly blend multiple images with integrated edge blending capabilities and built-in HDBaseT. It also provides carbon savings meter, sleep timer and auto power on. The NEC NP-PX602WL-WH has many exciting features for users of all types. See the NEC NP-PX602WL-WH gallery images above for more product views. The NEC NP-PX602WL-WH is sold as a Brand New Unopened Item.